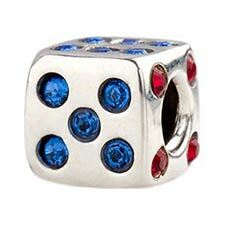 Let luck roll with you by wearing this sterling silver die with a mix of blue and red CZ crystals all around. Approximate size is 9.5mm x 9.8mm x 9.5mm. Threaded core for compatibility with most bracelet systems.